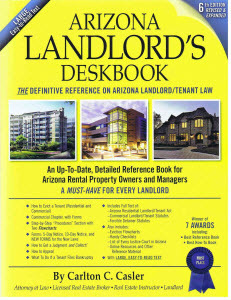 Arizona Landlord Tenant Blog: Is an oral month-to-month residential rental agreement binding? Is an oral month-to-month residential rental agreement binding? In Arizona, a month-to-month rental agreement is binding. A month-to-month rental agreement can be oral or written; both are enforceable. In either case, both the landlord and tenant must give thirty days advance written notice to terminate tenancy. The applicable statute provides: “The landlord or the tenant may terminate a month-to-month tenancy by a written notice given to the other at least thirty days prior to the periodic rental date specified in the notice.” (See ARS Section 33-1375.B). The phrase “the periodic rental date specified in the notice” means the beginning of the next rental term. If tenancy renews on the first day of each month and rent is due on the first day of the month, then the “periodic rental date” is the first of the month, which would then mean that a thirty day notice would have to be given at lease thirty days prior to the first day of the month. For example, if today is the fifteenth day of the month (any month) and I give a thirty day notice to terminate a month-to-month tenancy today, then tenancy would terminate at the end of the next month, not at the end of this month and not on the fifteenth of next month. The same is true if I gave a notice on the sixteenth day of the month, the last day of the month, or any day in between – tenancy would still terminate at the end of next month. You also have to take into consideration the number of days in the month and the method of service. If you serve the written notice in person, don’t count the day of service; if you send notice via certified mail, you will need to add up to five additional days to the thirty day notice (see ARS Section 33-1313 regarding notice).